Working to achieve a goal of peace. Belgium does not sit on the Security Council to seek prestige but to contribute to the achievement of a peace objective. For our country, it is a matter of prioritizing the search for political solutions over the use of violence; helping to prevent conflicts through respect for human rights, the rule of law, and international law; understanding that sustainable development is a necessary foundation for stability. It is in this spirit that we take up our seat on the Security Council: in accordance with its commitments, Belgium will work toward "Building consensus, acting for peace". On 8 June 2018 Belgium was elected to the Security Council by the UN General Assembly, with 181 votes (out of 193 UN Member States). This is Belgium's 6th term in the Council (1947-48, 1955-56, 1971-72, 1991-92, 2007-08). The mandate lasts two years and starts on 1 January 2019. Belgium joins the 5 permanent members (China, France, Russia, United Kingdom, USA), 5 non-permanent members elected in 2017 (mandate 2018-2019: Ivory Coast, Equatorial Guinea, Peru, Kuwait, Poland) and 4 non-permanent members also elected in June 2018 (Germany, Dominican Republic, South Africa, Indonesia). I. HOW DOES BELGIUM APPROACH ITS MANDATE? The election of Belgium is a mark of confidence from the members of the United Nations. In accordance with the Charter, Belgium has the obligation to act on behalf of the entire international community, and therefore to have first and foremost world interests at heart. But we assume this responsibility with a Belgian and European perspective. A new expression of our multilateral commitment. Multilateralism is under pressure. Confidence in international mechanisms is being questioned. Belgium intends to embody in the Security Council the multilateral vision that has been the hallmark of its foreign policy for 70 years. Belgium's presence on the Council is not isolated from its overall foreign policy: it offers an additional instrument. Belgium will continue its strong human rights profile and its attention to the European dimension. Belgium's position on the Council will build on its bilateral relations and its action in other international organizations. A permanent commitment to dialogue. During its mandate Belgium intends to continue the spirit of dialogue and will strive to promote, with pragmatism and common sense, its traditional role of mediator as expressed with the slogan: "Building consensus, acting for peace". Reaching a consensus for peace is possible only on the basis of partnerships with all relevant actors ... Belgium will promote the involvement of regional organizations, whose role is increasingly important in crisis management. It will also continue the cooperation with certain groups of countries affected by particular issues, such as Small Island Developing States (SIDS). Contribute to the smooth functioning of the Security Council. There is quite some criticism of the Council: lack of transparency, abuse of the veto, belated action, polarization... Our ambition is to contribute, in small steps and in consultation with other members, to lead the Council again in a constructive direction, focusing on a few concrete points of action. Belgium intends to contribute substantially to debates on all major global issues and all geographic files. However, this global scope will not prevent it from putting the spotlight on its own points of attention, based on its values ​​and particular expertise (Central-Africa, Sahel, Europe, Middle East). Belgium will pay particular attention to themes it has invested in for a long time. Regarding these thematic issues, Belgium will particularly strive to promote their practical application, concretely, in the mandates issued by the Council and on the ground. 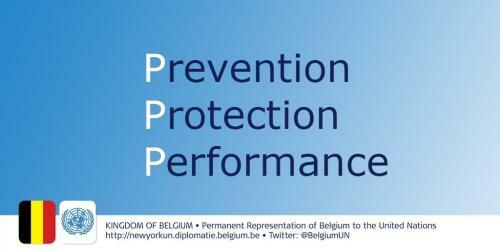 Conflict prevention is an essential element of Belgian foreign policy. The UNSC must be able to address alarming situations, which are not yet international conflicts, before they degenerate. Keeping crisis situations on the agenda can also play an important preventive role. Attention to mediation, new threats created by climate change, and the continued commitment to non-proliferation of weapons of mass destruction are also part of this. International security is about the security of every person. Belgium will emphasize respect for human rights as a condition for peace and security. The protection of civilians is one of the main tasks of the UN missions. Specific attention will be paid to the protection of children in armed conflict. In the Council, Belgium will also maintain its very strong profile on the fight against impunity and on humanitarian access. Topics such as the fight against terrorism and demining also remain important. More than 100,000 men and women (military, police, civilians) are currently serving in United Nations missions. Our country's annual contribution to these organizations is close to 65 million dollars. The effective operational management of these United Nations missions is of great importance. Our country also continues to support the reform agenda of the Secretary-General and the synergies with other UN mechanisms such as the OPCW and the Human Rights Council. The Women, Peace and Security agenda is part of this framework; the involvement of women in both political and operational processes leads to better results in policy- making and in the field. Like all members of the Council, Belgium will chair certain subsidiary bodies of the Council. Council members also distribute among themselves the task of "holding the pen" on certain specific subjects, i.e., to draft resolutions and other Council decisions. These particular tasks will bear on how Belgium exercises its mandate and require a significant investment; Belgium will endeavour to accomplish them with dedication. (5) "Focal point" for the International Criminal Court, in consultation with members of the Security Council who have also ratified the Rome Statute.